FERIA DE KAKANIN. The kakanin has its day in Rizal Province. 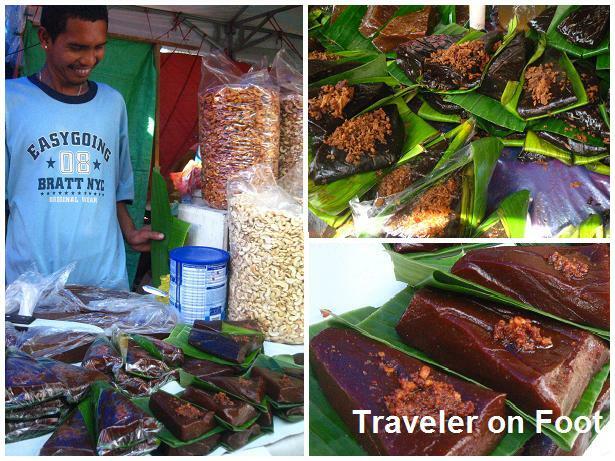 It happens on September 9, when native rice delicacies like the suman and the kalamay are paraded down the streets of San Mateo during the yearly Kakanin Festival. On regular days, the kakanin are sold in marketplaces around the town. On fiesta day, however, the kakanin are given away for free. SUMAN FOR ALL. The Kakanin Festival is a recently introduced folk-religious holiday. It was officially initiated by the Catholic church in the late 1990s. 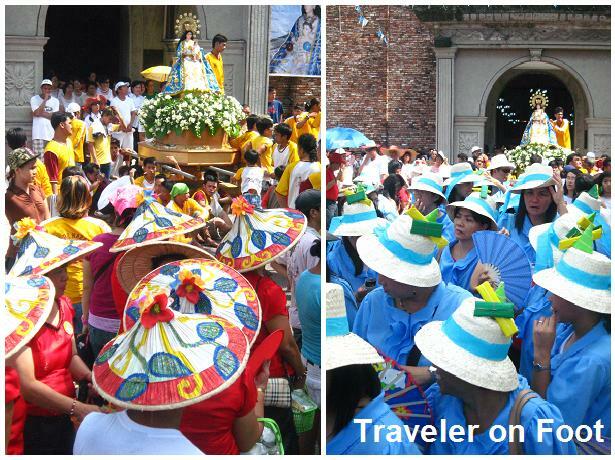 But in tradition and essence, the festival celebrates rice harvest and the feast day of San Mateo’s patroness –Nuestra Señora de Aranzazu. ARANTZA ZU? TU EN EL ESPINO? According to the legend, these were the words of the shepherd Rodrigo de Balanzategui, upon seeing a small stone image of a seated Virgin on top a thorn-bush after the Blessed Mother appeared to him in the mountains of Aloña in the province of Guipuzcoa located in the Basque region of Spain. The story goes that the townspeople were skeptical with what the boy shepherd reported to them until out of extreme desperation for rain, they went to see the image. Upon returning to their village rain poured and they regarded it as a miracle from the Blessed Virgin. The townspeople built a chapel on the site where the image was discovered. NUESTRA SEÑORA DE ARANZAZU. The devotion to the Our Lady of Aranzazu quickly spread around Spain and throughout its colonies, including the Philippines. In 1660, when the Jesuits took over the church of San Mateo, a great flood destroyed the first church located near the river banks in Barangay Sta. Ana. A new church was constructed on the site of the current church and placed the church of San Mateo under the advocacy of the Nuestra Señora de Aranzazu. THE CULT OF THE ARANZAZU. The first image of the Virgin of Aranzazu was brought to the Philippine by a Spanish captain from the Basque region. In 1732, the Dominicans of Letran in Intramuros made effort in spreading the devotion to the Nuestra Señora de Aranzazu among Filipinos. PARADA NG KAKANIN. 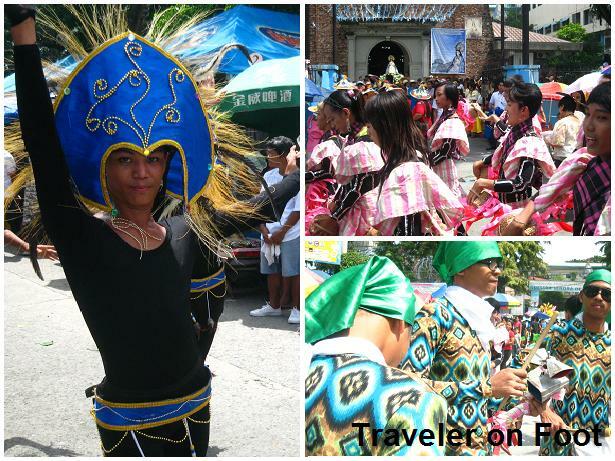 In San Mateo Rizal, devotees of the Our Lady of Aranzazu “dressed up” for the procession or locally called Parada ng Kakanin. By nine in the morning, the throng of people along the streets surrounding the church began to swell. The procession wouldn’t begin until the first group in parade line began to move forward. FIESTA SCENES. Soon the drums, orchestrated and not so orchestrated began thundering the chaotic scene and the first school marching band came into view. Finally, after some delay, the Parada ng Kakanin had officially began. EPILOGUE. For the next half hour or so, floats carrying candidates for the Mr. and Ms. San Mateo passed through the crowd of townsfolk and guests. School groups in bright costumes and CAT cadets performed synchronized marching and formation. Finally, the ladies in striking national costume made their way down the street dancing, chanting, and lifting their baskets of kakanin up in the air as offerings to the Nuestra Señora de Aranzazu.